Bad news, predictions of crashes, the arrogant finally getting their comeuppance: These stories grab eyeballs and get re-posted on social media. And much of the country finds the Bay Area insufferably smug – its wealth, home prices, unicorns, Google buses, 26-year-old billionaires, liberal politics, and much else – and if it is finally getting its just deserts, that is entertaining news. I get that: Sometimes, I find us insufferably smug myself. But let us investigate the issues a bit deeper. First of all: Without argument, there are big economic and social challenges facing the Bay Area: high housing costs; high state income taxes; recent federal tax law changes; the hostility of the current federal government to foreign immigration; rising income inequality, poverty and homelessness; growing commute times and other quality of life issues; national and international concerns; and, yes, population migration trends too. This was covered in some detail in our recent report Positive & Negative Factors in Bay Area Markets. It is certainly true that places like Austin and Seattle, with much lower housing costs and no state income taxes, are actively luring our businesses to relocate or expand there, and doing so with some significant success. More people are NOT leaving San Francisco or the Bay Area than arriving. When you tally both domestic migration in and out (to and from other places in the U.S.), and foreign migration, more people are arriving than leaving. It is true than in the past 2 years, domestic net migration has shifted to a net loss, but that deficit is still overcome by the large positive in foreign immigration. Is the shift in domestic migration worrisome? Yes, if it continues to grow. But it is not cataclysmic in its current proportions, and there are further underlying factors to consider, which shall be discussed later in this report. The Bay Area population is still growing both from migration and natural factors (births less deaths), albeit at slower rates than the torrid pace of previous years. As the WSJ admits in its article, SF and SF metro area populations are not shrinking: The SF Metro area population increased by .6% in the last 12 month period, as measured by the census through 7/1/17, which is one tenth of 1 percent lower than the .7% national rate. And a slower rate of growth than our recent population explosion is not a bad thing, since the Bay Area is bursting at the seams from growth without concomitant improvements in housing supply and infrastructure. The representation by Business Insider that 49% of residents were looking to move out is simply absurd. Really? Every other person? If people were fleeing or planning to flee in the proportions suggested, one would expect every other home in the Bay Area to sport a “for sale” sign, while the percentage of homeowners selling their homes is actually at historic lows: Less than 2% of SF house owners sold their homes in 2017. (The ratio was higher for condo owners, but still low at something over 4%.) I suppose it is possible that in the frenzy to get away, people are simply abandoning their homes instead of selling them. Many of the people leaving inner Bay Area counties are moving to adjacent counties, such as Solano, Sonoma, Sacramento, Santa Cruz, San Joaquin, San Benito and Stanislaus Counties. Many of those people almost certainly continue to work within the metro area. To some degree, the Bay Area economic zone is expanding geographically, not declining. The Bay Area over the past 7 years has been one of the greatest new-wealth creation machines in history. With the recent Dropbox IPO, it seems to be cranking into gear again – and there are still dozens of other local unicorns such as Uber, Pinterest, Airbnb, Palantir, with total values in the hundreds of billions of dollars – that could yet go public. Uber has already stated its desire to do so in the near future. A substantial portion of those leaving the Bay area are retirees, cashing out on high home prices to move to less expensive locales, such as other counties in California, and Nevada, Arizona and Oregon. This is not a new phenomenon, as it has been going on for decades, though it may have accelerated in recent years, since cashing out has become so much more lucrative. Most of those coming to the Bay Area are coming for new jobs, and the Bay Area remains a magnet for many of the best and the brightest around the world. Besides which, every year, thousands of Bay Area students graduate from schools like UC Berkeley, UCSF and Stanford, to take jobs locally as well. Economically, the Bay Area is trading many residents who are, to a large degree, checking out of the economy for people in the prime of their working lives. Millions of square feet of new commercial office space continue to be snapped up as soon as they come on market, even before the buildings are finished, and the only possible reasons are new businesses arriving and existing businesses expanding, both of which are fueled by continued hiring. The Bay Area certainly has substantial challenges to face and it is not sure it will overcome its problems. And it is true that people and businesses are moving out in greater numbers than any time since 2002. But, on the other hand, start-ups continue to start up by the hundreds, local business continue to expand, and the Bay Area undoubtedly remains one of the most innovative and dynamic economies in the world. And despite all its faults and problems, it is still, in my opinion, one of the great metropolitan areas and best places to live on the planet. The next 2 charts glance at house value appreciation in a few major districts around the city, from most affordable to more expensive to most expensive. As mentioned before, houses in more affordable neighborhoods have seen the most competitive market dynamic, and most consistent appreciation, in recent years. In both the cases below, the difference in price per square foot between smaller houses and the largest houses runs about $200, or about a 15% to 20% difference. The S&P CoreLogic Case-Shiller Index for the San Francisco Metro Area covers the house markets of 5 Bay Area counties, divided into 3 price tiers, each constituting one third of unit sales. 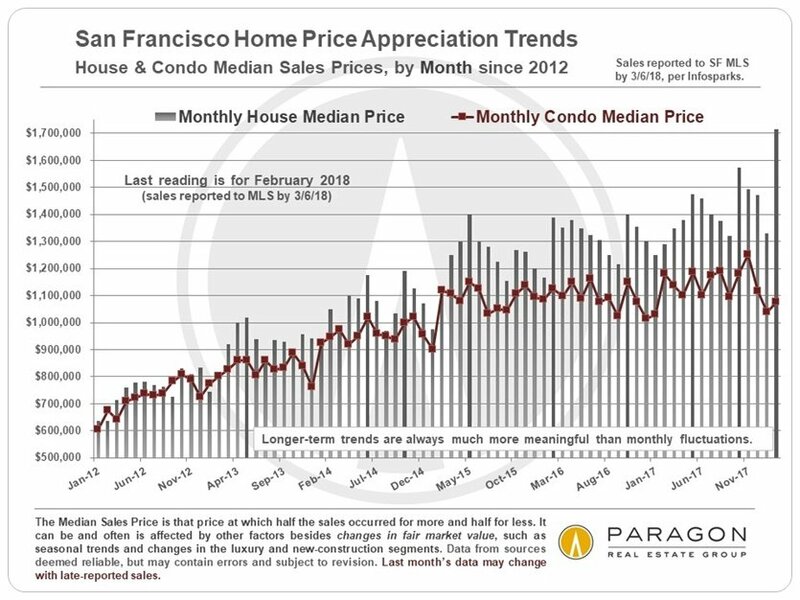 Most of San Francisco’s, Marin’s and Central Contra Costa’s house sales are in the “high price tier”, so that is where we focus most of our attention. We’ve also included some data on the Case-Shiller Index for metro area condo values, but unless otherwise specified, the charts pertain to house prices only. The Index is published 2 months after the month in question and reflects a 3-month rolling average, so it will always reflect the market of some months ago. In effect, we are looking into a rearview mirror at the market 3 to 5 months ago. The December 2017 Index was published at the end of February 2017. Much more information regarding the Index’s methodology can be found on its website. Low-Price Tier Homes: Under approximately $685,000 Huge subprime bubble (170% appreciation, 2000 – 2006) & huge crash (60% decline, 2008 – 2011). Strong recovery and has just recently popped a tad above 2006-07 peak values. Currently appreciating more quickly than other price tiers.